But it got me thinking. Didn't you hear the sizzle? lol There is another thing you can do to "try" VR and that is to get a relatively inexpensive Google Cardboard headset and try THAT before commit to a more expensive Google Daydream View, GearVR, PSVR, HTC Vive or Oculus Rift. Google Cardboards can be found for less than 50 dollars often MUCH less, and sometimes are even given out free. This is a fast, cheap and easy way to try VR before making a big investment. NO its not as good, BUT yes it will give you a real taste of what is possible. Eh, I did that just to see if it would be worth it. But ultimately I think Oculus and Vive provide an overall better demo environment; especially if you have an iPhone. Do NOT miss JauntVR on your iPhone! I think that trying is great, but you need to try for more than once every headset, when I first tried the Rift just by setting it up was amazing, later that week maybe I was playing a game and felt nauseous, for not apparent reasons. The thing is, even if you try something maybe in this particular situation the HMD and the different experiences you can try are so wide that maybe you hate the Museum experience but you love the roller coaster or maybe you ate recently and that didn't help you. But yes, it's nice to try it before. This is a good point! Sometimes VR makes me a little nauseous, sometimes not, a LOT depends on the app, and on the amount of time I spend under. I think IF you start to feel uncomfortable take a break, the VR will still be there in 10 minutes. BUT for example I can watch a short 360 video, or even a longer regular movie or TV episode (on Hulu, Netflix etc) with no problems. 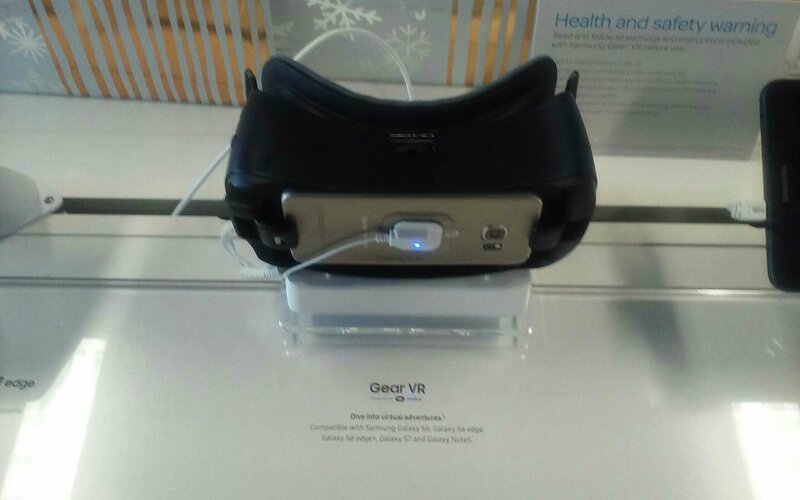 My only complaint with the Gear VR demo stations is some stores have them in these huge lockboxes so you can't move around! so is it better for movies or games? Well I think the phone based units are better at VR movies and other VR content that is just visual, VR experiences so to speak. Games are good too, BUT VR gaming is much better on the more expensive computer based units or Playstation VR. I've tried the Cardboard which I actually really liked. How much better would you say that the Rift/Vive will be? Is it in any way comparable, or it is a completely different thing and experience? Could you maybe detail in what it is significantly different? I think that I would go for one of the headsets anyway, but I am just intrigued to know. My experience has also been limited to the cardboard and it's plastic copycat ilk. The resolution is really not good enough to be fully immersive in my experience, and I would LOVE to try the full Vive/Oculus experience, but seriously cannot afford the device which is like over $1000 AUD. PLUS I'd need buy a 1070/1080 based desktop (if 'I'm going to do it it would have to be done properl). Or fit a Razer Core to my Blade Stealth or Skull Canyon NUC + the card itself. Sure prices are going to come down but we're really looking at more than $2000 AUD starting price here unfortunately for now. And at this stage I'm just not sure it's going to take enough of my life over to justify that cost (by saving my pennies). If ever a demo comes to Western Australia for sure I'd need to have a play. It would have to be absolutely awesome though to justify the costs. Ramrunner73, might be time to book travel to Los Angeles to buy the gear, or at least get to a Microsoft store or Best Buy to try stuff out! But I think sometimes the smartphone option is a really immersive experience too, but mostly for visual experiences. Where are good stores to try out several different VRs ? It may have already been stated, but Best Buy has an oculus rift setup for demo a time schedule for a one-on-one session to try it out. That's what convinced me to give it a whirl. well, u have also possibility to return the bought item via amazon return policy or some other return policies of some other stores.